I have been in Syria for six days with friends. I lived there for years and love it so it is always a joy to go back. However, that all pales into the background after the events of this week. On Sunday morning I had twenty-five ladies visit me as part of a bus tour. I have never been the subject of a bus tour before and was somewhat uneasy. They were coming to see the house and the quilts. I had been away for the week before and was not sure that the house would pass the 'run your finger over the lintel' test. Mind you, I considered this briefly and decided that anyone willing to do that deserved, at least, a dirty finger. I had promised a tour of the quilts and morning tea, and agonised a bit over the morning tea too. It is still Ramadan so I knew some people would be fasting. The club is a mix of Egyptians and expatriates though, and so morning tea needed to be on offer. We decided on fresh juice as they arrived. Ahmed has started to make the most delicious fresh lime and mint and honey juice - blended WHOLE limes and mint in water, strained through cloth and mixed with a little honey in hot water. Chill and add ice if you wish (I freeze mint leaves into the ice) and it is really delicious on a hot day. The temperature is starting to drop but it is still over thirty most days. We also made fresh guava juice. I have always thought that I didn't like guavas. I have trouble getting past the heavy perfumed aromatic fug that hangs around them. Add to that the slightly gritty over-ripe pear texture and I have always ignored them. Here they are everywhere. They are pale yellow globes, lumpy like a quince but the size and vaguely the same shape as a pear. They nestle in their thick green leaves in boxes, or wonderful towers on the fruit stands. The cool yellow and dark green looks refreshing. In my first six months here I was offered a thick white drink on a tray and took one. Ah - I thought - banana milkshake! The taste confirmed it - cool and creamy and smooth and rich. I was halfway through it and enjoying every mouthful when someone commented that their cook had made guava juice for everyone. It still took me a moment to realise that that was what I was drinking. So - our lovely elegant Nubian waiters in their crisp black and white offered trays of lime-mint, guava or water. I walked the tour around the quilts and the first floor, took them up to the next level and more there, then announced that we would look at my studio but that it meant a serious climb. The trouble with six metre ceilings is that it is a long long way up when you need to go up three floors. I kid myself that it keeps me fit - but I am not fit so I am obviously not doing it often enough, or fast enough. Some of the ladies were mopping brows as we reached the top - but all loved the studios. Then tea. For those Aussies who read this it is all going to be very dull. My lovely cook made sandwiches last time we felucca-ed. They were made with cold toast and featured a piece of fried egg and a piece of chicken speared with a toothpick to stay in place. I had quietly decided to show him our sort of sandwich so made my mother's amazing Christmas chicken sandwiches and an egg and lettuce one to give variety on the plate. Then I taught Ahmed pikelets and had to restrain him from piping elegant rosettes of cream onto the jam with a "No - it has to look home-made". "But," he said "I am a professional'. I pointed out that we were making a perfect Australian tea and this was one of the things that was important and he was happy with that. Add in Anzacs (biscuits for the non-Australians), a slice with a spiced base and an almond and ginger topping, small cupcakes flavoured with cardomom and rosewater and topped with lemon and cream cheese icing and a scatter of jewelled pistachio slices and pomegranate seeds, and the world's best chocolate cake which is almost a baked chocolate mousse. Ahmed has become a specialist at making the last - we are demanding it for many occasions at the moment. They ate - all except two - and left. We have almost one hundred people tomorrow for an Iftar. Iftars are always buffets or heavily waitered - as everyone has to be served by the time the call for prayer starts. I walked into the kitchen this morning to find every single pot out on the benches. It looked a bit chaotic - and was. So many things need to be presoaked. Khameruddin - the apricot leather which is cooked with water and is a traditional way to break the fast soaked in about four large pots. Another four pots were simmering chickens on the stove for chicken soup. Lentil soup will be made tomorrow. Khakadeh simmered on the second stove top or cooled on the benches ready for straining in the last group of pots. We did an emergency run to the shops for large new plastic bins to store it all in overnight and it is now down in the cold room. Khakedeh is a dried hibiscus flower - almost like a succulent - that is simmered for about half and hour with water. The strained liquid is deeply ruby red and spicy. It is sweetened and served either hot as a tea, or cold in Summer. I love it - it is just like a fresh plum juice. 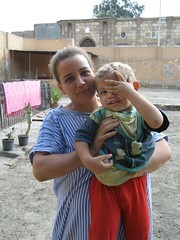 At one point of the preparations Ahmed spoke rapidly to Veronica in Arabic, asking her (he calls her Um Abdullah as this is the name of her eldest son - so 'mother of Abdullah')to taste the Khakadeh. "I am fasting" she said. Both looked at me. I agreed that I would taste the Khakedah and they dippered it from the large bin it had just been strained into and poured a small portion into a tea glass. I sipped and it was delicious. "It is very very good," I said. A second sip. "It's perfect". "Perfect for you?" said Ahmed anxiously. "Yes. "I said. "Absolutely perfect". He reached into the cupboard, took out another two kilo bag of sugar and slit it expertly open. Before I could even draw a breath to comment it had gone into the bin with the juice. "Egyptians like it sweet," he said. I am still chuckling hours later. It seemed so funny. We have split and seeded dates, chopped dried figs and apricots, and soaked them in khameruddin with coconut. They will be lightly sweetened and a bit of rose water added tomorrow. This is not a dessert but the first thing eaten. So the fast will be broken with juice, then the kushaf (the dried fruit compote), then soup for those who wish to have it, and then a break before the rest of the meats - lamb, chicken and kofta and a fish the size of a two year old - and salads. Dessert is baclava style pastries, and icecream cakes to celebrate a series of birthdays. So think of me tomorrow - hosting what is starting to feel like a very big breakfast at five twenty two! Exactly. Iftar must be the only meal in Egypt that is ever exactly on time. I took two visitors to the City of the Dead last week. I love this area. 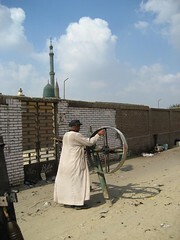 In Egypt, unlike in other Islamic countries, there is actually a tradition of tending graves and even visiting them. In most Islamic society a body is in the ground within twenty four hours. This is so here. In Saudi Arabia it is simply put in the ground wrapped in a white cloth. Here it is still buried within twenty four hours, but a coffin is used, and in many cases there is an elaborate family vault. In a country where the average citizen in Cairo has a few allocated metres of space in housing they get a great deal more when dead. In other countries in this region the funeral rites really take part after the burial. Families sit in silence with the immediate family of the deceased. Guests come and go through this period and it can go on for up to a week. Women wear black and no makeup and jewellery. Men and women sit in separate areas (and I have, very irreverently, wondered if this is due to the 'no makeup and jewellery' ruling). Caretakers marry and have children so the small families grow and add other ramshackle rooms. Those children grow and marry and create more housing in spaces between family graveyards. Slowly humanity takes over the City of the Dead. As the Lonely Planet Guide says, "ideal location, with very quiet neighbours". All down the long alleys between blocks the spinners of silk thread work. They come out int he mornings, like spiders, setting up their long webs of fibres and walking their three legged spinning wheels. Forward, as the thread spins and tightens with the twist. Then back as they slacken it off. Grooves cut into the the dirt surfaces of the roads in the places where the wheels are walked. Down to the three marker stones, slacken, then back. Repeat - again and again. 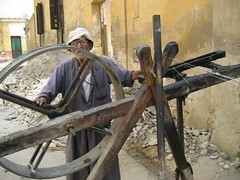 The wheels are made of the simplest of materials, the men are old or very young, as the healthier mature men are able to seek more lucrative employment. In my early days of visiting this place I took many many photographs and was always asked for backsheesh. There is a gentle and significant rubbing of forefinger and thumb which is almost universal. Now I find that the spinners I regularly visit do not ask for money, and many are offended if it is offered. Yet these are men who earn about two dollars after a day of hard toil on a wheel. I am honoured that they consider me friends, but wish they would take the small amounts I offer to reduce their hardship, when I live so well. 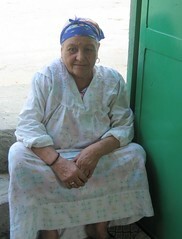 Mother on the doorstep. It is really common here for galabiehs or nighties to be worn at all times in the house - street clothes are put on to leave the house only, and removed when the wearer returns. There is not real embarrassment about receiving friends in a nightie. 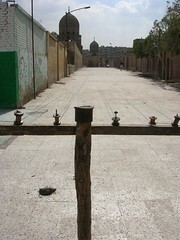 The City of the Dead is a huge area that wraps around Cairo and encompasses about half of it. It is large flat areas which are walled expanses of family vaults. Sometimes tombs are visible, sometimes it just looks like areas of paving. In each case one paved area will easily lift out, leading to stairs under the space which has the actual graves inside. Sometimes this is actually nowhere near the small above ground tomb. Each space has an allocated caretaker who looks after it and lives within the enclosure in a small hut or room. His job is to keep an occasional plant watered and to arrange chairs and the space if the family notifies him that they will visit. To move from the dead to Angels is a fairly obvious step. In the areas all around the Khan al Khalili are angels, - dark angels or bad angels as they are often called here. These are well presented men, with good English who are in a way the personification of the Nigerian scam. Their modus operandi is simple. Fall into step beside an obviously foreign visitor, chat for a few minutes to "Practise my English" and they are well spoken, friendly and courteous. Once you relax a little they offer to show you something a bit unusual - how the backgammon boxes are made, or a place that dyes silks, or a school where children are taught to weave - and the angels are very good at picking something which will interest you. They then weave you through many alleys - and often you are actually walking loops to make sure you actually need them to get back. Any suggestion that you might pay is greeted with horror and affront and "I am showing you as I like to use my English" or "No, it is because I thought you would be interested, I do not want your money"! At this point you are shown a shop "of my uncle", or some family member. You are offered drinks, or given a small box, or something that will make you feel indebted. Then they will show you bigger and much more expensive things as they show you how slow and difficult and intricate they are to make. It is made obvious that you are expected to buy as you are being treated specially. The worst of all this is that some of this sequence is common here - from very nice and honourable men who just want to help and who will not apply any pressure to buy at all. The difference is that the 'angels' are emotional manipulators of great expertise. An unwillingness to buy will subject you to initially subtle pressure of the "I brought you here for nothing from the goodness of my heart, but these men are very poor and Ramadan is a time of giving...et cetera". Or you are taken back to the point you came from and the requests for money go on as you walk to leave you feeling unkind and ungrateful. Sometimes they will actually shout in deep offence and anger at you - so poor manipulated people will hand them fistfuls just to make them go away as crowds gather. Sometimes a tourist policeman in on the scam will approach and suggest a payment which might be appropriate - and they will split it as you leave. You know you have been done by an angel when you feel guilty and distressed afterwards! Somehow you are always left feeling thoroughly bad - hence the 'dark angel' or 'bad angel' title. Underneath it all I constantly remind myself that this is a very poor country and that I am in comparision, very rich.